When it comes to expertise in the Maryland area on gutter replacements, there’s one company that stands out: Fick Bros. Roofing & Exterior Remodeling Company. 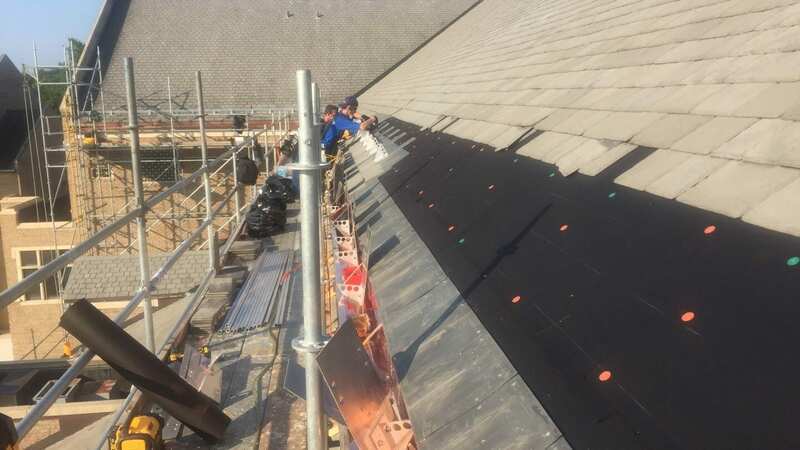 The company recently handled an extensive gutter replacement project that had them removing five courses of DaVinci Roofscapes slate tile on two large buildings. Then a box style gutter was installed to replace a failing gutter system — totaling about 750 linear feet of gutter/eave. After that, the DaVinci synthetic slate tiles were reinstalled along with a new pipe snow rail system. New copper downspouts and counterflashing completed the job. To describe the “ins and outs” of this extensive project, we turned to Jamie Fick, Vice President of the Commercial/Institutional Division at Fick Bros.
DaVinci: How unique was this project for your team? Fick: Truly, the job was much larger than those we typically handle, but it’s exactly the type of work we do. 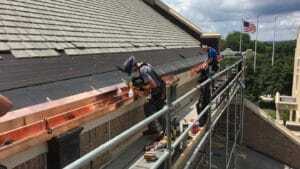 We install a lot of copper gutters and do a good deal of slate and copper work. The challenge with this one was its size. This project required significant scaffolding set up to create a safe work area. DaVinci: Describe the project and how it involved DaVinci synthetic tiles. Fick: This was not a re-roofing project. We were hired to perform the gutter and snow rail install since the gutters appear to have failed from heavy ice and snow. DaVinci: So, you started with the removal of the DaVinci slate tiles in order to achieve your goal? Fick: Yes. We began by removing five courses of DaVinci slate. Because the synthetic tiles are more flexible than natural slate, we found they were easier to remove and reinstall once the project was complete. DaVinci: What did the project include once you removed the DaVinci tiles? Fick: We replaced all the box gutters on both buildings with new 16 oz copper shop-fabricated copper ogee-style box gutters. These had new 1/8” x 1” copper bar hangers, 1/8” x 1” copper bar support straps and new 16 oz copper eave flashings. Next we reinstalled the DaVinci tiles over new ice and water shield and 30 lb felt paper underlayment. Then we replaced the old snow retention system with a new Alpine PP125 mill finished pipe snow rail system. During this process we repaired one broken PVC vent pipe and installed six new 20 oz copper vent pipe flashings. As part of the job we also replaced approximately 40 linear feet of damaged downspout with new 4” x 6” 16 oz custom shop fabricated copper downspout. Then we replaced about 15 square feet of counterflashing on one parapet wall with new 16 oz copper custom shop fabricated counter flashing. As I said, this was a really large job that required a great deal of detail work. DaVinci: What tips would you give other roofers if they were handling a similar project? Fick: The gutter design we used was a large shop-fabricated box-style gutter with both hangers and straps that attached to the roof deck. We removed enough courses of the roofing material to install the hangers and also to apply a full sheet of ice shield to the eave. Next we incorporated the new Alpine snow rail assembly. We used pry bars and slate rippers to remove the fifth row of tiles. Once that row was removed, the remainder of the courses were easily removed because the nails were exposed. I don’t believe we damaged or broke a single DaVinci tile. 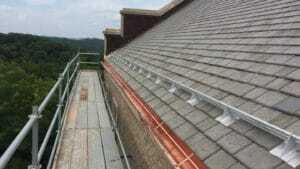 We saved time by stacking the roofing tiles on our scaffold and saved them for reinstalling. This structure used a random width tile pattern. So, it took a bit more thought and effort to reinstall the tiles in conjunction with the snow rail assembly. Having extra random width tiles on hand is helpful when completing each course and maintaining the proper side lap. DaVinci: The DaVinci tiles on these roofs had been in place for a number of years. What was their condition when you started the project?